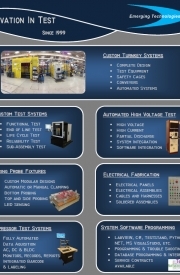 The Emerging Technologies, LLC staff provides a combined background of over 50 years of experience providing innovative solutions in automation and test. Emerging Technologies takes pride in its ability to gather all details required to execute a successful project. In many cases, all necessary information is not readily available at the start of a project. In such cases, Emerging Technologies can execute a feasibility study, process testing, develop a functional specification, or simply further define existing project details to help all parties involved have the information required for success. In many cases this approach is executed as a team with members from Emerging Technologies and the customer. Customer focus has always been, and will continue to be, an integral part of each and every project. We believe that understanding the requirements for a successful project at its inception is crucial to the success of the project. Making sure that the customer is kept up to date is also a priority at Emerging Technologies. This is important because what we do is to go where others have not already gone. We are the team that can get the job done because that is what we do every day. Join us in celebrating 15 years of test systems innovation! 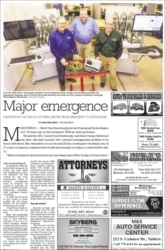 Manitowoc's Lake shore Chronicle featured Emerging Technologies in the "Progress" column. Emerging Technologies has been doing business in Manitowoc since 1999 with systems all across the United States and 3countries world wide.